What kind of beer ages well? Most American beers taste best when they're fresh, but candidates for cellaring include the high-alcohol brews, bottle-conditioned beers with yeast in the bottle, barleywines, lambics, and winter ales. 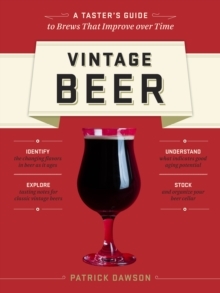 Vintage Beer explains how to identify a cellar-worthy beer, what to look for when tasting vintage beers, the science behind the aging process, and how to plan and organize a beer cellar. There is also a buying guide to commonly available and rare vintage beers to enjoy as one's own collection is aging.